To some commentators, it was no coincidence that the Venezuelan Supreme Court of Justice’s (TSJ) decision to sideline the National Assembly was announced less than 24 hours after the March 28 OAS Permanent Council session. Seeming to come as a direct response to what the Venezuelan government depicted as an illegal intervention in its internal affairs by the Permanent Council, the TSJ’s move was taken as evidence of the futility of pressure from Latin American countries to play a role in resolving Venezuela’s crisis. However, the government’s backtracking from the Court’s two controversial decisions issued on March 29 challenges this argument. Although the reversal is incomplete and still allows President Maduro to make decisions about mixed enterprises and hydrocarbons without legislative approval, it suggests that regional pressure can indeed influence the Venezuelan government’s actions—particularly when combined with domestic resistance, like Attorney General Luisa Ortega’s firm and vocal opposition to the TSJ decisions. For this reason, it’s worth taking a look at the strong regional outcry that emerged last week in Latin America. These responses seemed to catch the government by surprise, and may have emboldened critics within the Venezuelan government to speak out as well. The foreign ministries of Argentina, Brazil, Guatemala, Panama, and Paraguay, among other countries, issued statements expressing condemnation and alarm at the decision. OAS Secretary General Luis Almagro called for the OAS Permanent Council to hold another extraordinary session in response to the move. The motion was taken up and a meeting is scheduled for Monday, April 3, at 2 pm ET. 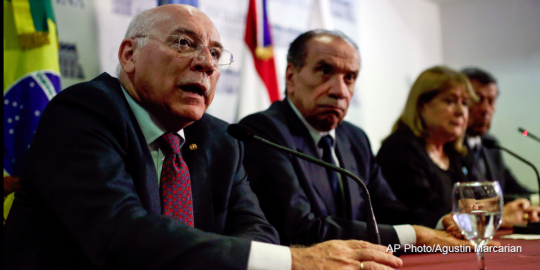 Moving forward, it looks as though Venezuela’s backpedaling on the TSJ’s latest decisions regarding the National Assembly isn’t satisfying the Latin American governments that have spoken out. Shortly after the TSJ’s April 1 revision of the decisions, the full member states of the Mercosur trading bloc—Argentina, Brazil, Uruguay and Paraguay—issued a joint statement pointing to a “break in the democratic order in the Bolivarian Republic of Venezuela” and calling for the establishment of a timeline for elections, the liberation of political prisoners, and the reestablishment of the separation of powers. At a joint press conference with her counterparts following the statement’s publication, Argentine Foreign Minister Susana Malcorra made clear that, despite the reversal, from the point of view of her government, the separation of powers “is not functioning” in Venezuela. Malcorra also told reporters that Mercosur was issuing the statement under the auspices of its “democracy clause,” even as she clarified that expelling Venezuela (which is already suspended from Mercosur for failing to adopt membership standards) would be a last resort. Meanwhile, the stage is set for yet another extraordinary session of the OAS Permanent Council this afternoon (April 3). At the March 28 session, 20 countries supported moving forward with a regional discussion of Venezuela’s crisis; the April 3 session may provide a sense of what those countries have in mind. As of April 1, the rotating presidency of the Permanent Council is occupied by Bolivia, not Belize, which could have implications for how the session unfolds. According to OAS bylaws, the president of the Permanent Council is tasked with calling meetings, directing the discussion, recognizing speakers in the order in which they request the floor, and deciding on points of order (though such decisions can be appealed by a vote). Considering the Bolivian OAS ambassador’s vocal opposition to discussing the situation in Venezuela, some observers have expressed concern that he could seek to minimize such debate today, or even seek to delay this or future Permanent Council sessions. However, as EFE reports, it is unlikely that he could prevent them altogether.